Beets are a wonderful vegetable. They are rated very highly as an antioxidant as well as containing many other healthful properties. I just love them. Even when I was little, I loved beets and their earthy, sweet flavor. They are wonderful simmered, peeled, sliced and buttered. That is the only way my mother fixed them until a neighbor invited us to dinner and prepared beets as she would have in her homeland, Poland. The beets were cooked until tender, peeled and sliced. Next they were mixed gently with a little sugar and sour cream. It was a new instant family favorite. Along the way, with all my gardening and cooking contacts, some wonderful person gave me her recipe for perfect pickled beets. 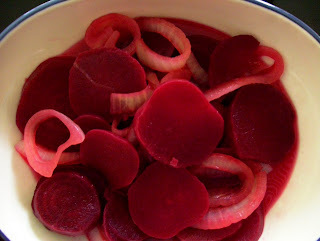 I had only tasted the canned varieties and was surprised how much better homemade pickled beets were. This recipe makes a small enough batch, so canning is not necessary. You may grow your own beets, buy them at a farmer's market or grocery store. You could even buy them canned and just pickle them like fresh ones. Beet stems should not be cut shorter than 2 inches from the beet top. Do not cut the root end. Wash beets gently. Put beets into a large pot and cover with water. Boil gently until tender. Remove beets, save beet water. Slip off skins and trim root and leaf ends. Slice beets 1/4 inch thick and place in a large bowl. Add remaining listed ingredients to a pot. Reheat to a boil and simmer until onion is slightly tender. Pour over sliced beets. Refrigerate.